To this day, one of my favorite flavors has been chocolate mint. I think it started when I first ate a thin mint cookie from the Girl Scouts. 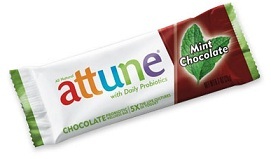 So when I happened across the Chocolate Mint flavored attune bars (I posted about a few additional attune bar flavors a while ago), I couldn't wait to get home to try one. And wow - was I impressed! The combination of chocolate mint and crisp rice is beyond yummy, sort of like a mint chocolate Nestle's crunch. And, like other attune bars, not only are the bars delicious, but they contain probiotics. I am especially impressed that they are packed with *five* times more probiotics than yogurt. And yet, they don't lose anything in taste or texture. I really like the crispy rice texture with chocolate taste that all attune bars have. Not only are these bars rich in probiotics but they are also a portable form of probiotics. One thing that I find challenging when I am on the go is keeping up with daily habits like taking supplements. So these bars are perfect – they work as a healthy portable snack. They are sold in the refrigerated section, but they do not require constant refrigeration. I've read that the cultures begin to decline after 1 month unrefrigerated. Calorie wise, each attune bar is only 3 weight watchers points plus points, with 90 calories, 6 g fat, 12 g carb, 1 g protein and 3 g fiber. Attune bars come in a ton of flavors: Chocolate, Chocolate Crisp, Almond Chocolate, Chocolate Mint, Blueberry Vanilla, Coffee Bean Dark Chocolate, and Raspberry Dark Chocolate. You can buy them in the refrigerated section of stores like Whole Foods or online at Amazon. Over the past few years, I've written about various milk alternatives - almond milk, soy milk, coconut milk. Today I thought it was time to give regular milk a fair shake and talk about some of its benefits. 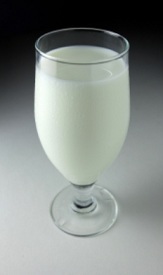 Milk is a good source of Vitamin D which millions of people are surprisingly deficient in. Even in warm weather, many people stay indoors or use sunscreen to protect their skin from the sun. Many doctors believe that maintaining sufficient levels of Vitamin D is key to good health, as well as in cancer prevention. Milk also contains appreciable amounts of protein and calcium which are good for our bones and muscles. Of course, I have to acknowledge that there is a lot of concern about how our milk is produced these days. Some people feel that the pasteurization process is quite harmful to the milk, altering its amino acids and killing the very enzymes which help our bodies assimilate the nutrients in the milk. All this has led to a resurgence of interest in raw milk. If you do not have a supplier of raw milk in your area or if you just prefer not to buy it raw, look for *organic* DHA-enhanced milk. DHA is an omega-3 fatty acid which is needed by the brain and the retina. It is a crucial element for optimum learning ability, mental development and good vision. Apparently Americans are quite deficient in DHA which is why many food manufacturers are adding it as a supplement. You probably don't have too much trouble finding ways to include milk in your diet. It is a great smoothie base, goes with cereal, hot or cold, makes a great base for hot chocolate and as a great midnight snack. I recently picked up a fitness magazine while I was checking out at the grocery store. The breakfast section had a recipe for a vegan Chocolate Espresso Smoothie that sounded good. So I decided to try it. I certainly couldn't pass up what appeared to be a recipe for a drink very similar to a low calorie frappucino! The recipe in the magazine used soy milk for the base, but since I prefer almond milk, I decided to try using chocolate almond milk instead. The chocolate almond milk I drink is made by Almond Breeze, and it comes in both sweetened and unsweetened flavors. The amazing thing about the unsweetened flavor is that it is delicious enough to drink, and is still only 50 calories per cup! Combine ingredients in a blender or food processor and blend until smooth. This recipe makes 2 servings at 140 calories, 1.5 g fat, 25 g carbs, 4 g protein, 2 g fiber per serving. Each serving is 3 weight watchers points plus points. I used the regular chocolate almond milk but you could also use the unsweetened kind (at only 50 calories per cup) for an even skinnier version, making the smoothie 2 weight watchers points plus points and only 78 calories per serving! There are many things I like as I anticipate the arrival of summer. But one of the things I love the most is enjoying various 'summer foods' that are so abundant especially in early summer, like corn on the cob, watermelon, peaches, nectarines, etc. Now that it is common for supermarkets to stock produce that has been shipped long distances, from the other side of the country or even from another hemisphere, we have a much greater window of availability for fruits and vegetables than their natural local growing seasons. For instance, you can buy mango almost any time of year, though where I live, it certainly does not grow year round. But as people try to eat more locally grown food, we naturally end up eating with the seasons and we get reacquainted with the natural growing patterns for various foods. And by eating according to the seasons we end up eating produce when it is most abundant in the market, which means it is a) at its cheapest price for the year b) in its freshest condition, not having spent weeks in transit and storage. As it is now, I always notice that in early summer the produce section of the supermarket has piles and piles of fresh, juicy peaches and nectarines. And of course, I remember that juicy watermelon is prevalent in summer too. I think apples are always best in the autumn. But I don't remember too much more than that. So I thought it would be helpful to feature a list of what fruits are in season at what time of year. Rhubarb – spring into summer; eat stems only; leaves are poisonous! These days food manufacturers seem to be cluing into the fact that many people desire healthier food with fewer mysterious ingredients. Unfortunately, some companies try to hop on the bandwagon by just pasting words like “all natural”, “fresh”, “pure” and so forth on their labels without doing much to raise the standard of the ingredients. But today's post is about a licorice that really is made from simple natural ingredients. It's Panda Licorice and here is the ingredient list for their regular black licorice: Molasses, wheat flour, licorice extract, natural flavor (aniseed oil). A neat thing about licorice is that in addition to being a fix for your sweet tooth, it has other perks too, such as helping people to relax and relieve stress. Why not give yourself a treat that restores you on more than one level? When you come across something like Panda Licorice that has exactly four ingredients, all of them simple, recognizable words, then you know you have found a good choice. You might be surprised to find that many candy items which are labeled licorice do not actually contain any real licorice extract. 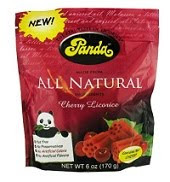 Panda licorice comes in several flavors and styles. You can get cherry, raspberry or black licorice in small bite-sized chews or in a single snack size bar. The herb flavor (green box) seems to come only in the bite-sized chews. One of their newer packaging styles is a ziploc bag that apparently really keeps the licorice fresh and moist. They carry one more flavor I have never tried – Licorice Creams with strawberry, caramel and banana fillings! This version does have cane sugar and skim milk powder whereas the others are all dairy-free and sweetened only with molasses. Whichever kind you try, most are only 3 weight watchers points points and around 130 calories per serving, 0g fat, 30g carbs, 2g protein and no fiber. The exceptions are the herb flavor which is 4 WW points but still 130 calories and the licorice creams which come out to 4 WW points and 160 calories per serving. You can find Panda at most health food stores or order it online through Amazon. I write about a lot of delicious low calorie foods here on Yummy Diet Food, but sometimes I find something I'm so excited about that I can hardly wait to post. Today is one of those days! I was recently introduced to Barry's Bakery French Twists, and my reaction was WOW! 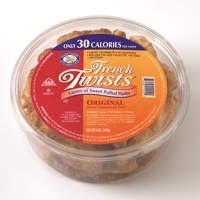 They are absolutely delicious and fully satisfy my sweet tooth, and with only 30 calories each, and 1 gram of fat (and only 1 weight watchers points plus point for every two twists). What you'll find inside of the container are delicious, crunchy puffed pastries, with the taste and quality of a sweet twist that you'd find at a cafe. They do not taste low calorie and feel like way more of an indulgent treat than they really are. Inside them is no dairy, no cholesterol, and no eggs. Just wheat flour, soy oil, palm oil, beet sugar, cinnamon (for the cinnamon flavor) and salt. Very simple straightforward ingredients. And, if that wasn't good enough, they come in several flavors including chocolate (my favorite), raspberry, california almond, and maple french toast. I highly recommend you try these out if you are looking for a low calorie sweet treat to eat every once in a while. You can buy them in many grocery stores, like Safeway, or online at Amazon. PS. In case you are wondering here are few other of my favorite discoveries: pizza pretzels, cocoa berries, frozen bananas, ice cream sandwiches, fat free cheese, and lucy's chocolate chip cookies. Usually at most cafes, the snack choices include items like chocolate, pastries and cookies, usually high in fat and sugar. And while there is nothing wrong with an indulgence from time to time, I like to save those for special occasions, or when I am really craving an over-the-top, all-out rich and decadent snack. So I usually look for something light to eat instead. So I was delighted to see a snack at a local cafe today that was quite healthy - Yogavive Apple Chips. The package says they are "organic popped fuji apple chips." I am not sure exactly what the 'popped' refers to, but I must say that it makes them pretty tasty! It's nice that they have *no* added sugar so you really just get a clean apple flavor. It is literally crunchy like a chip but the flavor is pure, sweet apple. They come in five flavors - original, cinnamon, caramel, peach and strawberry. And I read that they have two more flavors coming out soon too - chocolate and vanilla. The size package I got at this bookstore cafe was a small bag - perfect for a quick snack at .35 ounces. Each bag contains the equivalent of one dried apple. And each serving is only 35 calories or 1 weight watchers points plus point. 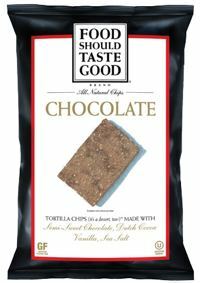 I found these chips at a cafe, but according to the store locator on the Yogavive website they are available at many stores. Vitamin Outlet stores particularly seem to be a regular carrier of these chips. And, for those of you who really prefer a more savory chip, Yogavive also has a line of savory flavors: Cheddar, Ginger, Barbecue and Garlic! I cannot really imagine garlic and apple together in a chip :) I will be keeping an eye out for these too. Do let me know if you've tried them. While dieting, it is easy to get so wrapped up in what to eat and what not to eat that we sometimes forget the other part of the weight loss equation – exercise! Exercise not only burns calories while we are doing it - it also increases our metabolic rate for several hours after we finish exercising. I have heard that it is better to exercise in the morning for this reason – our metabolism will be churning along at a higher rate than if we had not exercised at the start of the day. Immune Health – Exercise stimulates the lymphatic system and a healthy lymphatic systems is crucial to a strong immune system. It is sometimes said that the lymphatic system is the body's first line of defense against disease. Exercise also improves circulation throughout the whole body helping to break up stagnant energy and bringing fresh energy to every cell. Energy – it sounds contradictory at first because exercise uses a lot of energy, yet it also credited with increasing energy. Perhaps because it improves circulation and breaks up stagnation as mentioned above. Stress relief! - When we are stressed we unconsciously clench our muscles which uses up a lot of our energy! Exercise helps shake a lot of this held in tension out. You have probably noticed how often after exercise you feel much more mentally relaxed. Getting the body moving helps the mind to relax. Creativitiy - The relaxation that results from exercise helps us be more creative in all sorts of ways. Oftentimes, the shift in mood and focus that exercise brings is exactly what we need to see a problem from a fresh perspective. Mood Elevator - Everyone has heard of runner's high which happens when the body produces endorphins from vigorous exercise. However, your body doesn't care if you are running, playing basketball or cycling. It is going to produce endorphins from any energetic physical activity and your mood will likely show it. This is why people suffering from anxiety or depression are often advised to exercise. Improved Sleep – it seems that we are at an all time high for sleep problems. Considering the effect of exercise on stress reduction, physical tension, mood and creativity, it is not surprising that after releasing some of our pent up energy through exercise, we will sleep better. I am all for anything that helps me get a good night's rest! So, now that we have reviewed why exercise is so important, I want to mention that it helps to choose a form of exercise that you enjoy. That way you won't think of the activity as another task on your To Do list but more like a refreshing change of pace. If you make a commitment to swim so many laps per day but you don't actually enjoy swimming, then you will have an inner resistance to executing your plan. That is a little self-sabotaging. I find it helps to remember that in simpler times when many people performed demanding physical work, they did not carve out a portion of the day for exercise. It was a byproduct of their normal activities. Likewise, in many cultures, people walk several miles a day as part of their normal routine of shopping and going to the bank. In most cities in the United States, it is common to drive almost everywhere. When a friend of mine was visiting the US several years ago, she was astonished to see that people can do their banking without even getting out of the car! With all that said, my personal favorite form of exercise is yoga. I like that it effects my body, mind and spirit. I have definitely felt the way that yoga increases my capacity to respond well in stressful situations. And it can be extremely effective at building strength, flexibility and balance. Once you have learned some basic routines, yoga can be done anywhere. No special attire needed aside from non-restrictive clothes. Classes are especially good for beginners to help ensure your alignment is right, etc. but once you are familiar with yoga, it can easily be done at home or while traveling. You can design your own practice, use some routines from a book or let yourself be guided by an instruction CD or DVD. Sometimes I am at a loss for what to eat for breakfast when I want something different but healthy, sustaining and satisfying. What I really like is a breakfast that is super-filling and grounding, something that will hold me for a while. 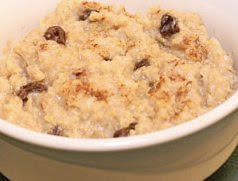 But when I want to mix things up a little, one really hearty and healthy breakfast I have is homemade millet pudding. This is basically just a half cup of millet (available in the bulk section of your natural foods store) cooked with about 2 cups of almond milk and a dash of cinnamon. (The cooked millet will come out to about 3 times the dry quantity). To cook, bring the mixture to a boil, lower the flame and let it simmer about 20 minutes. Because of the nut milk, it may boil over if the flame is too high. Keep an eye on it. The end result is more like a porridge than a typical pudding, but my friend who shared this recipe with me calls it "pudding" so I am calling it that too. She made it with non-dairy chocolate chips inside and calls it Cocoa Millet Pudding. Yum! If you have a sweet tooth, you could add some honey. Or dress it up with nuts and raisins or whatever you can think of. You can also just cook millet with water and after it is cooked, add a little rice or almond milk if you prefer. Which brings me to why millet is so good for you. Hopefully you will see why I think it is worth the trouble. First, millet is an honest to goodness whole grain! It is not just "made with whole grains" which have been pulverized, ground, rolled, cut, baked or anything else. It is the real deal. Aside from brown rice and maybe oats and barley, many of us hardly ever eat whole grains when they are still *whole*, if you know what I mean. So while it may seem like a lot of effort for what is essentially a breakfast cereal, the benefits of eating something completely unprocessed is that you get the maximum energy from the grain. No energy is lost by turning it into a flour. Millet is one of those foods that has been largely pushed to the sidelines in the American diet. Many people think of it as great bird food. However, this stuff is not just for the birds! The health benefits of millet are numerous. Rich in protein and fiber, it is thought to help prevent heart disease and some forms of cancer. Although it takes a bit of time to make, this quantity will make 3 half cup portions of a very nutritious breakfast at 4 weight watchers points plus points and 166 calories each.